Hi everyone! We have been having summer-like weather here, and although it has been nice, it is abnormal, so I am hoping all the budded trees, plants and food crop are not killed by a freeze later. 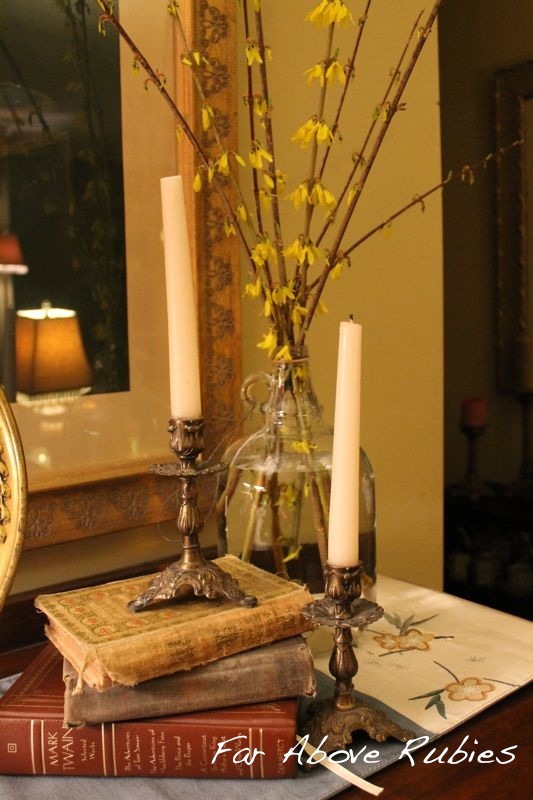 I have always loved bringing flowering branches inside, and I got an early start this year. I remember my grandmother's "yellow bells" as a child, always bursting with those brightly-colored yellow blooms. I learned later they were actually Forsythia. I have two different varieties to show you. This is the kind most people have. 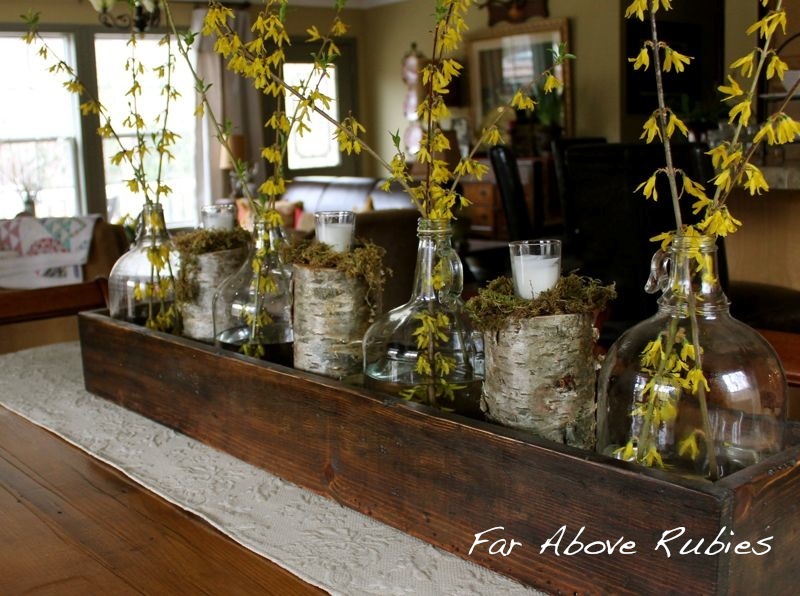 I placed them in an old bottle on my piano over a casually draped piece of burlap. This is one of the bottles I found here on the property. These are actually from my great grandmother's plants, and you can see why people here call them "yellow bells" as the flowers hang down and have a bell shape. Also in an old bottle, these are on my sideboard with some of my grandfather's books and my grandmother's candlesticks. I also added some to "the box" in between birch log candleholders. I ended up changing out the matelasse runner for the Waverly toile runner as I wanted more color. These branches have lasted for several weeks and I have really enjoyed having them. I think they add more of a contemporary feel to all the vintage things I have in here. 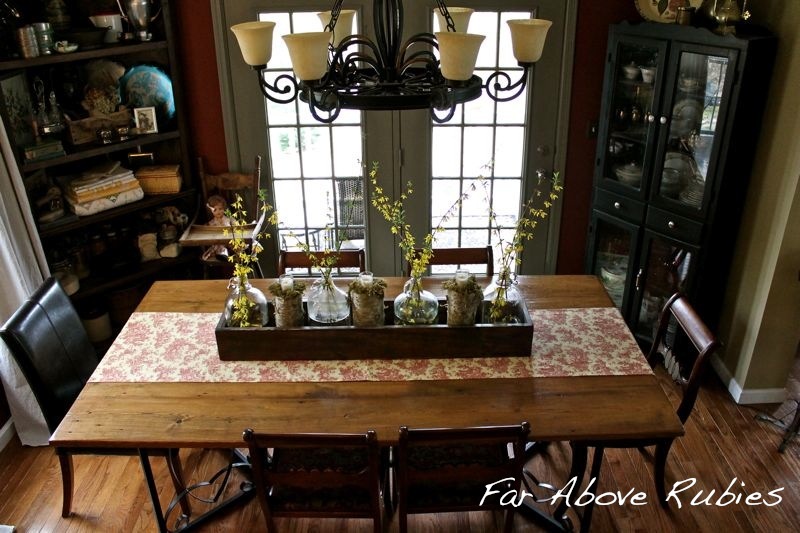 I'll be sharing a tablescape this week here with Pfaltzgraf, Mikasa mixed with vintage Franciscan pieces, so be sure to stop back by Thursday for that. 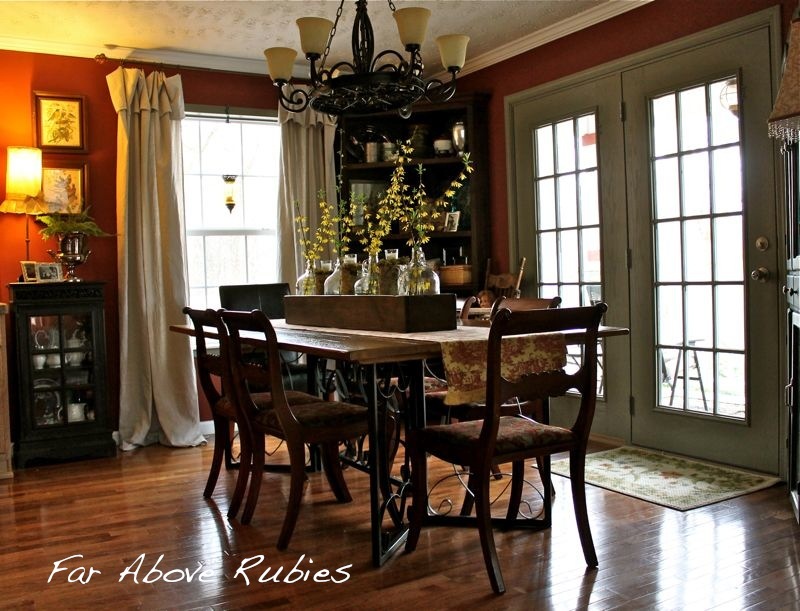 Your dining room centerpiece is fantastic. Love the candles in the bark. Beautiful, Anita! You have such style sense and wonderful treasures from your grandparents. Have a great week! 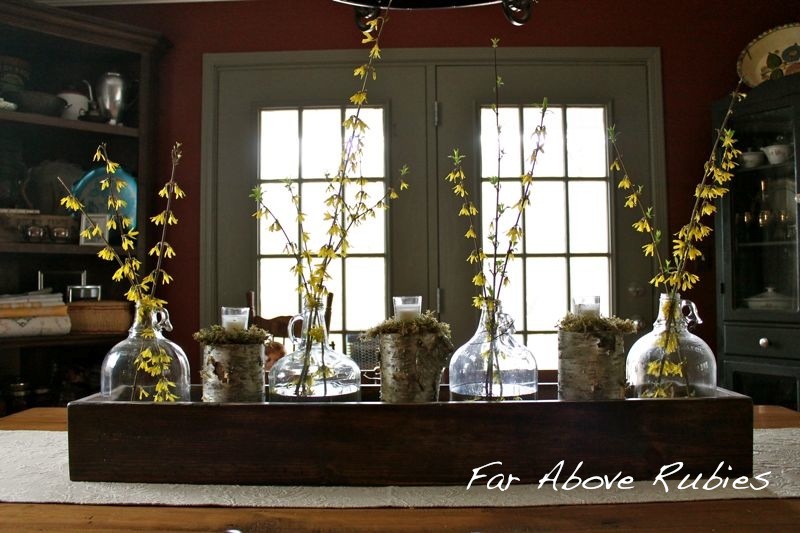 I love forsythia Anita and yours look beautiful displayed in those pretty jugs! Have a great week! 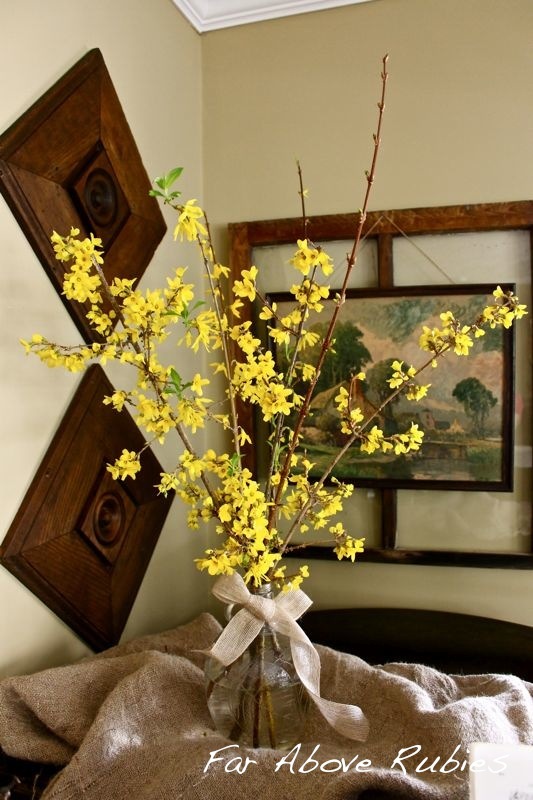 Anita, I love forsythia plants! That pop of yellow just works in so many settings! I love how you have displayed it in your home. All of your vignettes are gorgeous! Looking forward to your tablescape, too! Oh yes, Spring at last! Anita, Yellow bells was what my grandmother always called them. All your arrangements are lovely, but I really like the one on your dining table with your antique box. It's really a great look. I saw a couple of English brass plaques/plates like yours at an antique mall. They had painted them a soft robin's egg blue and "antiqued" them with a taupe/beige color.I was surprised, but it actually looked ok that way. However, I like that you left yours brass. It works so well with your colors.Have a great week. I LOVE bringing in flowers! They so easily brighten up a room! Hi Anita! I loved your sideboard but then I scrolled down and I think I love the Box on the table even more! Actually, I love it all. Your home always seems so warm and welcoming. 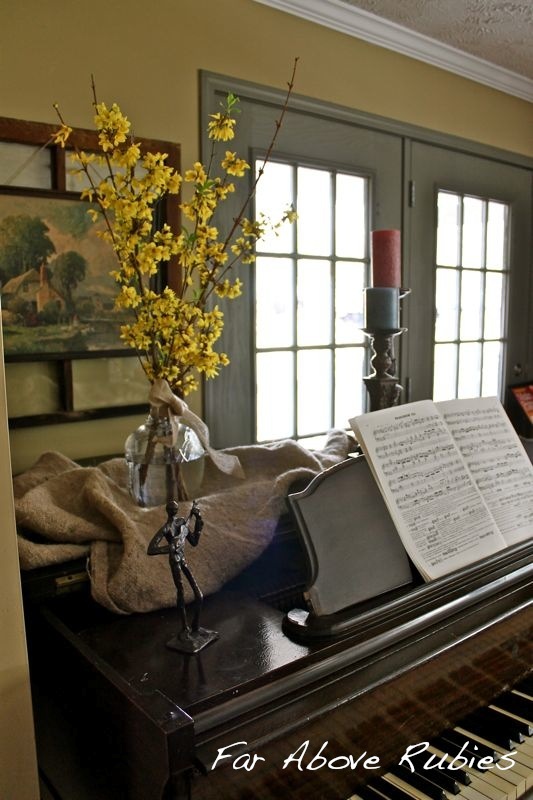 I love how the warm yellow of the flowers works with your decor! Just lovely!! Yellow is my favorite color so I am especially fond of yellow blooms. Everything is gorgeous! So very beautiful! 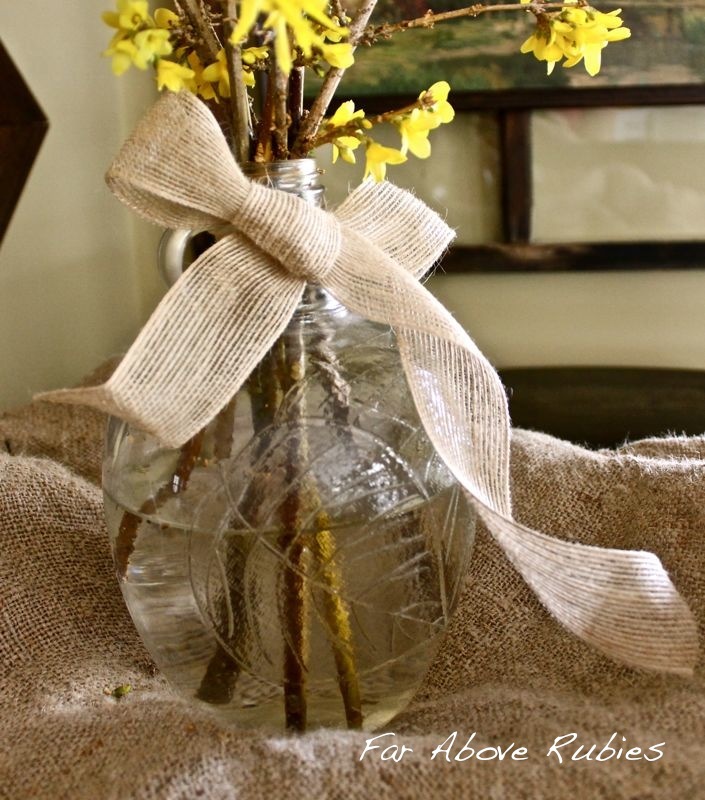 Love all the ways you've used the Forsythia/yellow bells. I always enjoy my stay on your super creative space. Beautiful, warm yellow here. Great shots and the room looks gorgeous. Ah, so beautiful! I love the yellow bells, as for me, yellow equals springtime! Never heard them called 'yellow bells'. But I do love them in those jugs. Great look! Congrats on the feature at Debbie's. Your home is lovely but more important it's warm and cozy. Very welcoming!